This document will attempt to explain the methods, materials and products of mining during ancient and medieval times. The first section will address how mining was done before steam shovels and dynamite. Each of the following sections will describe a different mineral that was known and used by ancient and medieval people, explaining where it occurred, how it was mined, its value and the things it was used for. In most cases this document will use archaic rather than modern terms. It is not a scholarly document by any means, and will always focus on making the material herein useful in gaming. Mining began during prehistoric times. Primitive man mined flint, greenstone, hematite, obsidian, jade and other minerals, often digging into the earth using antler picks to get to them. Ochre was clay that was turned into body paint. The Picts used it for war paint, some Africans for body paint, and Egyptians as a cosmetic for the eye lids and lips. Flint, obsidian and jade were used to make tools and weapons, as they could be cleaved to form an extremely sharp edge. The Egyptians quarried granite, limestone, marble, diorite, alabaster and basalt. They also mined for copper, tin, turquoise, beryl, amethyst, lapis lazuli and malachite. The patron goddess of Egyptian miners was Hathor. Beyond antiquity, people learned to process the seven classic metals: gold, silver, copper, tin, zinc, iron and mercury, as well as dozens of variety of stones. The Chinese improved smelting with the invention of the blast furnace and the method of puddling iron ore. Medieval Muslim engineers built on the Roman’s use of water mills, creating grist mills, stamp mills and steel mills. Ancient miners used a few main methods to extract minerals from the ground. The most basic involved the collection of minerals from alluvial deposits, which is to say deposits of gravel and stones made by rivers. This was probably the way that primitive man first began using minerals, by picking them up off the ground and gradually discovering their uses. Archaeology has revealed that primitive man used a variety of minerals in his crafts, including (but not limited to) ochre, flint, obsidian, jade, copper, electrum and platinum. Sometimes, however, the minerals are in plain sight. The Romans used a hydraulic mining to clear soil and get to the bedrock, especially quartz containing gold. Roman engineers would direct multiple aqueducts (presumably smaller ones than those which supplied towns and cities with their drinking water) to a mining site. The aqueducts would be used to fill a number of large tanks. Once they were full, the tanks were opened and the rushing water cleared topsoil from the bedrock. Fire-starting, described below, was then used to get to the gold. The Romans and other cultures also used water to power mills that could pump water out of mines, smash ore, and eventually to power bellows attached to furnaces used for smelting. Salt was also sometimes mined using water. A salt pit would be filled with water. Once inundated with the salt, the water, now called brine, was scooped up and boiled down until nothing but salt crystals remained. Salt pans, large tubs made of a cheap ceramic material, were also used to boil down seawater. Once one has collected all the minerals they can the easy way, they must become more inventive. Following a seam or vein of minerals underground could be accomplished in a couple different ways. One ancient method was called fire-setting. 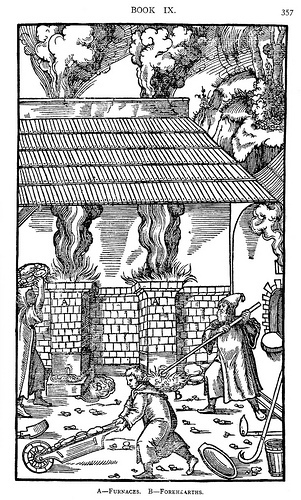 In this technique, a large fire is built next to stone, especially limestone. The fire causes the stone to expand and crack. Once cracks appear, miners can pound the stone into chunks using hammers. These chunks of stone are then processed to get to the valuable mineral inside them. The process of fire-starting would eventually lead miners underground. This could involve open pit mining, which was often used to obtain copper and iron. In pit mining, one merely digs a large pit, processing the ore as they go. Miners also followed veins and seams by digging shafts into the ground in a process called deep mining. Deep mining involved fire-starting as well as picks powered by human muscle. Shafts would be horizontal whenever possible, digging into the side of a hill or mountain. These shafts were called adits, and they provided ventilation and easy way to extract ore. Other times, shafts would be sunk vertically, with hand holds or stairs built into the shaft. Vertical shafts would be connected by horizontal shafts in a complex that mimics the dungeon of classic fantasy role-playing. Salt mines dug in this way often grow to monstrous sizes, as they are usually the remnants of dry sea beds and thus cover a great deal of area. Ancient salt mines in Poland and Iran feature thousands of tunnels and hundreds of chambers, including temples. In 1627, a new method was devised to replace fire-setting, namely black powder. While this would not be quite as powerful as the dynamite one associates with mining in the Old West, the effect was the same. While stones like granite and marble can be quarried from large pits and dragged away intact, most minerals, especially metals, require some processing. The most basic form of processing is washing the stones off. Washing is a common way of removing gems from ore. Placer mining, often used for gold, involves smashing the ore into dust and then washing it with water using pans. The heavier gold drops to the bottom of the pan while the rest of the material floats away. When dealing with metals, smelting is the order of the day. Smelting involves smashing the ore into chunks and then using a furnace to melt away the metal, which is collected in some manner of receptacle. Different metals melt at different temperatures, allowing them to be separated from one another as well as from the ore. The oldest ways to smelt ore were open fires powered by the wind and clay ovens. Open fires and clay ovens, however, only get so hot, and thus can only be used for metals that have a low melting point. Bloomeries were more powerful furnaces used for smelting iron. A bloomery looked something like a chimney, and it was stoked with a bellows operated either by people or with wind or water mills. The bloomery created a slag called a bloom, or sponge iron. The bloom could be further processed into wrought iron. Bloomeries were powered by charcoal, which is to say wood. Bloomeries need a large supply of wood. Blast furnaces are more powerful than bloomeries. They were invented by the Chinese. Where a bloomery makes sponge iron, a blast furnace makes pig iron, which is further refined in a forge called a finery to make bar iron. The Chinese also invented puddling. Puddling consists of stirring molten metal in the open air to remove carbon and become wrought iron. Wrought iron was then mixed with pig iron to make steel, essentially iron containing a very small amount of carbon. As the Chinese gradually lost their forests to their iron industry, they began using bituminous coal in its place, which saved their forests and produced much hotter fires. Each mineral entry will include the following information: the ore it comes from and what it looks like, the types of rock the ore is associated with, the methods of mining and smelting the metal from the ore (if applicable), the uses put to the mineral and its general value in a fantasy economy. Legends surrounding the mineral are also addressed, as they are often useful in a fantastic setting. The value of metals is stated in terms of how many coins (gold pieces, silver pieces, copper pieces, etc) can be rendered from a pound of the material. Precious stones are divided into three categories to determine value. All precious stones are assumed to weigh 4.5 grams, the same as the standard coin (thus 100 stones to the pound). Minor gems (fancy stones) have a base value of 5 gold pieces (gp). Medium Gems (semi-precious stones) have a base value of 50 gp. Major Gems (jewels) have a base value of 500 gp. Using these three categories saves Referees and players the trouble of keeping track of the individual values of precious stones.